Review by AllTheBestFights.com: 2019-02-09, nice and tough exchanges between Alberto Machado and Andrew Cancio: it gets three stars. The undefeated Wba super-Fw champion Alberto Machado entered this fight with a perfect record of 21-0-0 (17 KOs=81%) and he is ranked as the No.3 super featherweight in the world (currently the #1 in this division is Miguel Berchelt). In his last three fights he has won over Jezreel Corrales (Jezreel Corrales vs Alberto Machado), Rafael Mensah (Alberto Machado vs Rafael Mensah) and Yuandale Evans (Alberto Machado vs Yuandale Evans). His opponent, Andrew Cancio, has a boxing record of 19-4-2 (14 knockouts) and he entered as the No.44 in the same weight class. He lost to Joseph Diaz in 2016 (Joseph Diaz vs Andrew Cancio) but then he beat Aidar Sharibayev and Dardan Zenunaj in 2018. 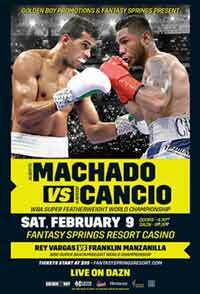 Machado vs Cancio is valid for the WBA World super featherweight title (Machado’s third defense). Watch the video and rate this fight! Review by AllTheBestFights.com: 2018-10-27, good start between Alberto Machado and Yuandale Evans: it gets three stars. The undefeated Wba super-Fw champion Alberto Machado entered this fight with a perfect boxing record of 20-0-0 (16 KOs=80%) and he is ranked as the No.3 super featherweight in the world (currently the #1 in this division is Miguel Berchelt). In his last three fights he has won over Carlos Morales (Machado vs Morales), Jezreel Corrales (Jezreel Corrales vs Alberto Machado) and Rafael Mensah (Alberto Machado vs Rafael Mensah). His opponent, Yuandale Evans, has a record of 20-1-0 (14 knockouts) and he entered as the No.66 featherweight. He suffered his only loss when he faced Javier Fortuna in 2012 (Javier Fortuna vs Yuandale Evans), since then he has won four bouts beating DeWayne Wisdom, Miguel Del Valle, Billel Dib and Luis Rosa. 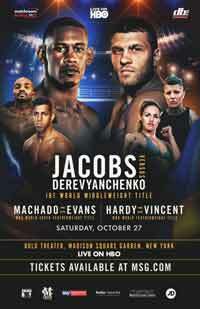 Machado vs Evans is valid for the WBA World super featherweight title; undercard of Daniel Jacobs vs Sergiy Derevyanchenko. Watch the video and rate this fight! Review by AllTheBestFights.com: 2018-07-21, fight not particularly exciting between Alberto Machado and Rafael Mensah: it gets two stars. Both undefeated, the Wba super-Fw champion Alberto Machado entered this fight with a perfect boxing record of 19-0-0 (16 KOs=84%) and he is ranked as the No.3 super featherweight in the world (currently the #1 in this division is Miguel Berchelt) while his opponent, Rafael Mensah, has an official record of 31-0-0 (23 knockouts) and he entered as the No.48 in the same weight class. Both boxers fought three times last year: Machado beat Juan Jose Martinez, Carlos Morales (Machado vs Morales) and Jezreel Corrales (Jezreel Corrales vs Alberto Machado) while Mensah won over Fatiou Fassinou, Edward Kambasi and Martin Ahiadekey. 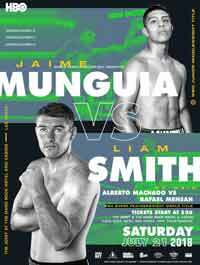 Machado vs Mensah is valid for the WBA World super featherweight title (Machado’s first defense); undercard of Jaime Munguia vs Liam Smith. Watch the video and rate this fight! Review by AllTheBestFights.com: 2017-10-21, great finish between Jezreel Corrales and Alberto Machado: it gets three stars. The Wba super-Fw champion Jezreel Corrales entered this fight with a professional boxing record of 22-1-0 (8 knockouts) and he is ranked as the No.3 super featherweight in the world (currently the #1 in this division is Vasyl Lomachenko). He suffered his only defeat when he faced Jhonatan Arenas in 2009, since then he has collected 21 victories and one no-contest beating twice Takashi Uchiyama in 2016 (=Uchiyama vs Corrales I and Corrales vs Uchiyama II) and Robinson Castellanos in 2017 (=Corrales vs Castellanos). His opponent, the undefeated Alberto Machado, has a perfect record of 18-0-0 (15 KOs=83%) and he entered as the No.18 in the same weight class. He has already fought twice in 2017 defeating Juan Jose Martinez and Carlos Morales (=Machado vs Morales). 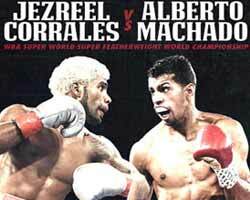 Machado vs Corrales is valid for the vacant WBA World super featherweight title (belt on the line for Machado only because Corrales missed weight). Watch the video and rate this fight! Review by AllTheBestFights.com: 2017-08-18, some good shots between Alberto Machado and Carlos Morales but it is not enough to get three stars: it gets two. The undefeated Alberto Machado entered this fight with a perfect record of 17-0-0 (15 KOs=88%) and he is ranked as the No.18 super featherweight in the world. In his last two bouts he has beat Orlando Rizo and Juan Jose Martinez. His opponent, Carlos Morales, has a boxing record of 16-1-3 (6 knockouts) and he entered as the No.48 in the same weight class. He suffered his only loss at his first professional fight, against Allan Benitez, since then he has collected three draws and 16 consecutive victories. 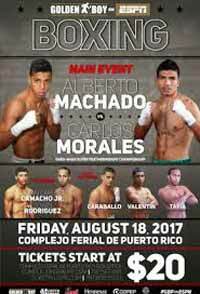 Alberto Machado vs Carlos Morales is the main event of the evening. Watch the video and rate this fight!